The Vatican Gardens are a tribute to nature in history and faith, so, in addition to walking on its trails you can stop in front of the sculptures, fountains, temples and grottos, you can also admire a lot of trees, flowers and plants from all over the world. The gardens are divided into the areas of the Pope's orchard, the Italian gardens and the English garden. There are several building house in the gardens, including the Governor's Palace, the State Court and the Vatican Railway Station. The Vatican Gardens are, therefore, an opportunity to admire a very suggestive place that combines artistic beauties with those of nature. In 1279, Pope Nicholas III transferred the papal residence to the Vatican around which he built a protective wall. Within the walls an orchard was cultivated, grass was laid and a small garden was created. The gardens were born in the vicinity of Colle Sant' Egidio, where it is now possible to see the Courts of the Vatican Museums and the Belvedere Palace. Visits to the Vatican Gardens begin at the most recently part formed. Between 1500 and 1600 the gardens inside the Vatican acquired more and more splendor with the enrichments brought by Bramante and Ligorio and by the painters Tempesta, Maggi and Falda. Fountains, temples and statues were built to adorn the gardens with a touch of Renaissance style. 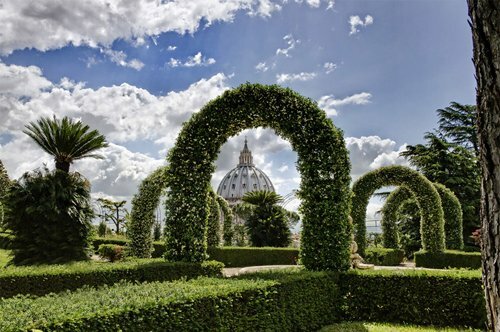 Today the Vatican Gardens occupy almost two thirds of the area of the Vatican City. Here, the Pope has the opportunity to rest and meditate. Still today there are some parts of the Leonine Walls and the two circular base towers called Torre della Radio and Torre Gregoriana. Within the paths of the gardens, you will find many fountains and some small temples, sanctuaries and grotto, such as the grotto of the Madonna della Guardia. Inside the Vatican, there is also a heliport introduced into the context by Pope Paul VI. Here you come after crossing the part of the French gardens where we find some of the most important trees and the large cistern that placed on the ground collects millions of liters of water for watering the gardens and feeding the fountains, as well as for provisions in case of fire. 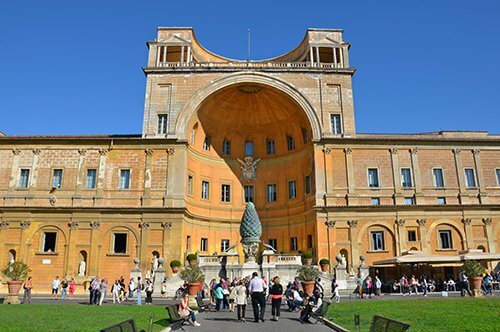 Did you know that the Leonine Walls, of which we still find remains in Vatican City, were built by the will of Pope Leo IV to protect the St. Peter’s Basilica and the Vatican Hill? The first project of the walls was characterized by the horseshoe shape that covers the protection area from the Mausoleum of Adriano down to the Tiber River on the side of the Janiculum Hills (Colline del Gianicolo). Did you know that one of the fountains found in the Vatican Gardens is called Galera (Galleon)? Built in 1621, this fountain represents a battle ship with cannons and sails from which water jets emerge. Another fountain is the Fontana dell' Aquila (Fountain of the Eagle) that was built on a small cliff where dragons and eagles are represented. 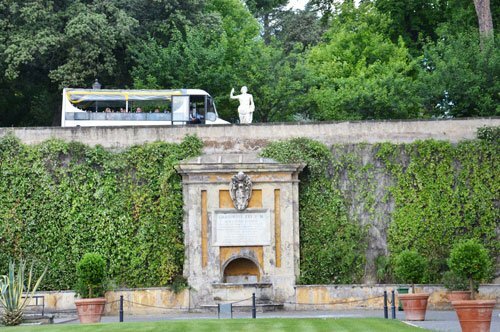 The Vatican Gardens can only be visited by participating in a guided group tour arranged directly by the Museums or by booking an audio guide tour on an electric bus. Very important note: the two options include the priority entry to the Vatican Museums. The Vatican Gardens frame the beautiful places you can visit within the Vatican City. 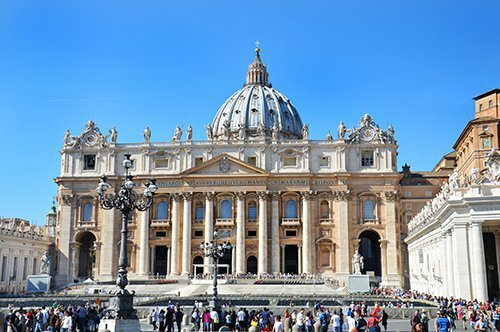 You can't miss the Vatican Museums where countless works belonging to the Popes are exhibited, the St. Peter’s Basilica, with its impressive architecture and the famous "Cupolone" and the Sistine Chapel, where you can admire the wonderful frescoes by Michelangelo. Once outside the Vatican City and with the Map of Rome in hand, you can continue your visit to the Italian capital. You can't miss the Colosseum, symbol of Rome known throughout the world and from it you can rediscover the remains of the Palatine hill and the Roman Forum. From the artistic and archaeological point of view, the sites of the Caracalla Thermal Baths and Villa dei Quintili are very interesting in the old Via Appia (Appian way) where the Tomb of Cecilia Metella is also found.  In Rome four important museums have been grouped under the name of National Roman Museum, these are the Palazzo Massimo, the Palazzo Altemps, the Diocletian Thermal Baths and the Crypta Balbi. The Capitoline Museums, whose origins date back to 1471, contain many works collected from that period and are located in the center of Rome, near the Capitoline and the Altar of the Fatherland. Not far away we find another site worth visiting, composed today by the ruins of the majestic villa that belonged to Nero, the Domus Aurea. Returning to the Tiber River, you can visit the Ara Pacis Museum, and on the other side of the river, Castel Sant' Angelo. One of the most frequented parks in the city is the park of Villa Borghese and inside it is possible to visit the Villa and the Borghese Gallery. 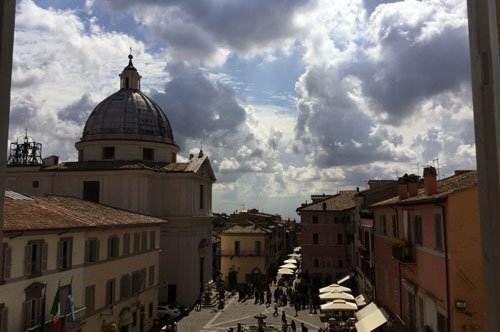 Another place with a particular charm that you can visit in Rome are the ancient Catacombs; but if you prefer to get away from Rome, a great option may be to arrange a visit to the beautiful town of Castel Gandolfo or visit the Villa d'Este in Tivoli, with its beautiful gardens.